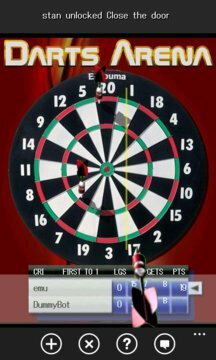 The #1 online darts game for Windows Phone. Wipe your screen and make sure you don't have sweaty fingers! This is the skillgame of the year. Play matches against opponents all over the world and compete in tournaments and leagues. Unlock achievements and climb the rankings. You can play 301, 501, Cricket, Round the Clock and Baseball. Chat with your opponents during a match and when you don't feel like playing you can hang around the lobby.